Laurel is a teenage girl who's been home-schooled and is now starting high school. David takes an immediate liking to her. 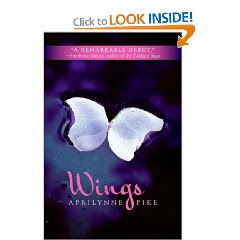 As she starts high school, she feels very different than her peers and she soon finds out why. She's a faerie; she begins to sprout wings and little by little learns more of her past. The book started out very slow, and I set it aside for a few weeks. It took a while to get the action going as we learned more about Laurel. There have been many comparisons made between this book and the Twilight series. Stephenie Meyer did give this book a hearty endorsement saying it was a remarkable debut. There are some similarities. Laurel is the new girl in school. She's kind of aloof and prefers to keep to herself. There is a love triangle between Laurel, David, and the mystical Tamani. I also felt the pacing of the book was a bit similar to that series. The action starts later in the book and leads to a dramatic end, leaving a feeling that there will be a sequel. I believe this is the first of a trilogy. I have to say I loved the last chapter. It was beautifully written and it made me hungry for the sequel. If you can stay with this book, I think it's worth it, and I am excited for the sequel. This is the first place I've heard the book starts slow. Interesting. I've been entering all sorts of contests trying to win the book because I don't want to buy it in hardcover and I don't think the library has it in yet. I'll let you borrow it. I'll be in SA this weekend. I'll be at my parents' house. I can give it to someone to give to you or drop it off or something. I'll try to remember to bring it and get it to you somehow. I bought it at Sam's and it was only like $10.88. A good deal. I don't buy books very often, but I really wanted this one. Although I think it starts slow, I wouldn't say it's boring or anything. It is interesting. I'd love to read your review after you read it.